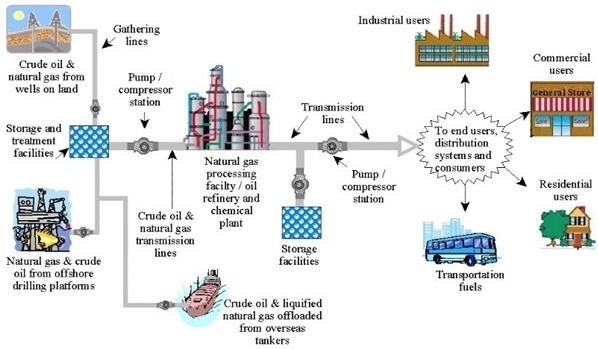 Transmission pipelines are used to transport crude oil and natural gas from their respective gathering systems to refining, processing, or storage facilities. Transmission pipelines also transport refined petroleum products and natural gas to customers, for use or for further distribution. With very few exceptions, transmission pipelines are dedicated to the transportation of crude oil, refined petroleum products, or natural gas. Transmission pipeline systems include all of the equipment and facilities necessary to effect the transportation of the products. This includes the pipe, valves, pumps or compressors, breakout tanks, storage tanks, refining and processing facilities and other equipment and facilities. Transmission pipelines are constructed from steel pipe and can range in size from several inches to several feet in diameter. Depending on the product being transported, transmission pipeline systems can be designed to operate from relatively low pressures to over 1000 pounds per square inch (psi) of pressure. They can range in length from hundreds of feet to hundreds of miles. Most pipelines are operated remotely from centrally-located control centers. These control centers allow for the efficient operation of either a single pipeline, or a number of different pipeline systems from a single location. Pipeline control center operators can start and stop pumps, open and close valves, monitor product movements, monitor leak detection systems, conduct training operations, and perform other system management tasks from a single operations center. Actions are taken in response to field data that is transmitted in many cases from hundreds of miles away. Often, the data observed at a central control center is confirmed with, and by, field personnel at affected locations, before actions are taken. Transmission pipelines are owned and operated by many different companies. The safety of construction, operation and maintenance of transmission pipeline systems is regulated by the Office of Pipeline Safety under 49 CFR Parts 192 and 195. The Federal Energy Regulatory Commission (FERC) regulates the transmission and sale of natural gas for resale in interstate commerce, and regulates the transmission of oil by pipeline in interstate commerce. FERC also approves the siting of, and abandonment of, interstate natural gas facilities, including pipelines, storage and liquefied natural gas (LNG). FERC does not regulate or provide oversight for the construction of oil pipelines; it does not regulate pipeline safety; nor does it regulate pipeline transportation on or across the Outer Continental Shelf. Transmission Lines: Where can I learn more?